Situated high above the City on Twin Peaks, this unique and wonderful home is ideal for elegant entertaining and comfortable relaxation indoors and out. The play of the ever-changing colors of the sky provide a rare panorama from the golden light at dawn, to purple/pink hues at sunset and dazzling City lights at night. Enjoy the inspiring, expansive cityscape and bay views, including the Transamerica Pyramid & Financial District and rare 'three bridge views' of the Golden Gate, Bay & San Rafael Bridges. The residence has been redesigned for truly modern living with the expert aesthetics of Gast Architects, landscaping by Jeff Miller of Miller Company Landscape Architects and the insightful input of the owners over a two year period. Enter through the custom front door hand-carved from exquisite white oak wood to the GALLERY. The focal point of the residence is the light and airy two-story view GREAT ROOM with expansive floor to ceiling picture windows, built-in granite fireplace and beautiful hardwood floor. Step out to the wrap-around view terrace and enjoy the cool breezes and fresh air. 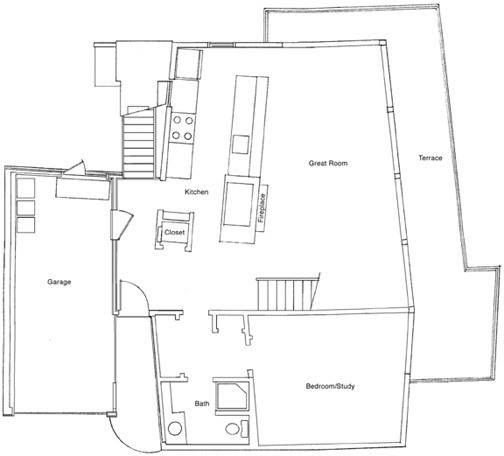 Off the Great Room is a BEDROOM, presently used as a Study and houses built-in cabinets for an entertainment system. The adjoining BATH with shower serves as the Guest Bath. Ascend the open staircase with wood risers to the view MASTER SUITE and east view balcony. The luxurious marble MASTER BATHROOM features a Jacuzzi tub, separate glass shower and large mirrored vanity. The adjoining oversized double Dressing Room provides custom wardrobe storage. Off the Master Suite is the very private and spacious SPA/DECK with a frosted glass windbreak on the south side for privacy. Clear glass on the north side allows for enchanting views of St. Ignatius Church, the Presidio, the Bay and twin towers of the Golden Gate Bridge. The oversized Japanese-inspired white tiled spa tub can accommodate up to six persons and makes for a stunning relaxing view corner protected from the elements yet outside. Descend the wide staircase with handsome colored glass sconce lighting to the beautifully finished MEDIA ROOM with coffered lighting and hardwood floor. This very spacious room can be furnished for multiple uses, including additional guest quarters or an at-home office/media room. The adjoining SPA RETREAT provides a Zen-like ambiance. It features exquisite green glass tile surround with overhead rain shower and expansive concrete vanity with large mirror. From the staircase, host and guests can conveniently access the flagstone TERRACE which provides wonderful outdoor space for entertaining and alfresco dining. The terrace landscape features an enormous banana plant, tropical plantings and a free standing mosaic barbeque stove with gas hookup. Flagstone steps lead to a lower level with workroom, wrap around garden & stairs to gardener's side entrance from the street. 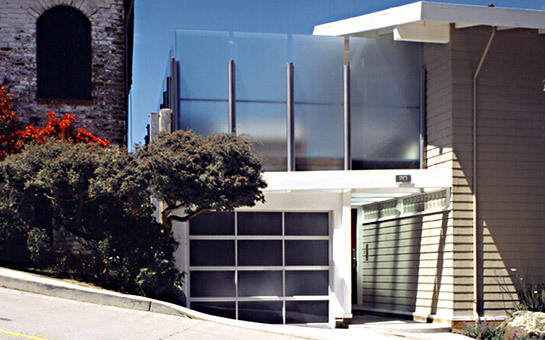 Small Firms Great Projects 2005, A joint publication of San Francisco magazine and AIA San Francisco. Outdoor Rooms Fresh Air Kitchens and Living Areas, Published in 2006 by Schiffer Books.